15 seniors at Unionville High School were named National Merit Semi-Finalists. EAST MARLBOROUGH — A total of 15 Unionville High School students were named today as National Merit Semi-Finalists by the National Merit Scholarship Corporation (NMSC), which announced the names of approximately 16,000 Semifinalists in the 64th annual National Merit Scholarship Program. 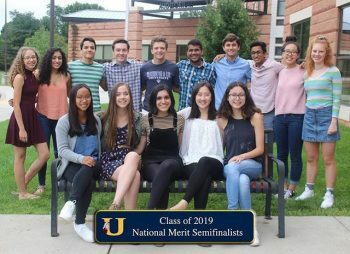 The following Unionville 12th grade students were named as 2019 National Merit Semi-Finalists: Grant Astin, William Bennick, Therese Foote, Jason Granato, Divyan Jain, Natalie Kelly, Noelle Lambert, Anna Li, Jessica Liu, Sophia Quereshi, Parikshith Radhakrishnan, Frederick Rajasekaran, Alexandra Rizaldi, Seline Stoop and Mira Zutshi. More than 90 percent of the Semifinalists are expected to attain Finalist standing, and about half of the Finalists will win a National Merit Scholarship, earning the Merit Scholar®title. Over 1.6 million juniors in about 22,000 high schools entered the 2019 National Merit Scholarship Program by taking the 2017 Preliminary SAT/National Merit Scholarship Qualifying Test (PSAT/NMSQT®), which served as an initial screen of program entrants. The nationwide pool of Semifinalists, representing less than one percent of U.S. high school seniors, includes the highest­ scoring entrants in each state. The number of Semifinalists in a state is proportional to the state’s percentage of the national total of graduating seniors. To become a Finalist, the Semifinalist and his or her high school must submit a detailed scholarship application, in which they provide information about the Semifinalist’s academic record, participation in school and community activities, demonstrated leadership abilities, employment, and honors and awards received. A Semifinalist must have an outstanding academic record through­ out high school, be endorsed and recommended by a high school official, write an essay, and earn SAT® scores that confirm the student’s earlier performance on the qualifying test. Three types of National Merit Scholarships will be offered in the spring of 2019. Every Finalist will compete for one of 2,500 National Merit® $2500 Scholarships that will be awarded on a state-representational basis. About 1,000 corporate-sponsored Merit Scholarship awards will be provided by approximately 230 corporations and business organizations for Finalists who meet their specified criteria, such as children of the grantor’s employees or residents of communities where sponsor plants or offices are located. In addition, about 180 colleges and universities are expected to finance some 4,000 college-sponsored Merit Scholarship awards for Finalists who will attend the sponsor institution. National Merit Scholarship winners of2019 will be announced in four nationwide news releases beginning in April and concluding in July. These scholarship recipients will join some 338,000 other distinguished young people who have earned the Merit Scholar title.